Established in the year 1996, we Zeal International, are one of the celebrated exporters and suppliers of an extended range of Material Testing Equipment. Our product selection comprises of Cement Testing Equipment, Concrete Testing Equipment and Cube Moulds that are applauded and accepted in the market for their robust construction, durability, operational fluency, consistent performance and accurate measurements. Our products are procured from the most experienced and trustworthy vendors of the market. We are extremely popular in the industry as we offer the best quality possible. At our company, we have established a magnificent warehouse that is equipped with various technologies that provide immense help in properly storing & organizing the products offered. In addition, we have hired a team of professionals, who are selected on the basis of their educational qualification, experienced and knowledge. Our team members are trained to put in their best efforts to cater to the exact client needs within the committed time frame. Owing to the consistent hard work and determination, we have garnered a long list of customers worldwide. We are a partnership firm under the capable leadership of Mr. Taran Sethi. Magnificent industry experience and knowledge, regular motivation and support of our mentor have inspired us to perform our best in attaining the organizational goals. We are tremendously famous for the proffered product range and aim to maintain the unmatched reputation in the coming years as well. We export our products in all over the world. Trading of material testing equipments . We have a highly qualified team of professionals at our firm. These professionals are employed on the basis of their skills and out of the box thinking abilities. These professionals dedicate their time and energy towards achieving various goals and objectives predefined by the firm. For the purpose of better management, these professionals have been sorted into a number of groups based on their skills and proficiency in specific vocations. The units work in close compliance with each other for maximizing the firm’s productivity, standardizing quality and facilitating R&D. 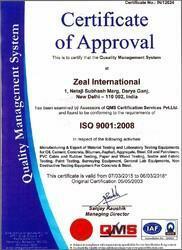 Zeal International is committed to provide Quality Equipment as per the International Standards and also the requirements of its customers and shall ensure their satisfaction at all times through continual improvement with the effectiveness of Quality Management System. 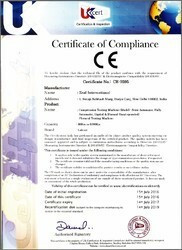 Achieved CE Certification On All Range Of Concrete Compression Testing Machine From UK Certification Board Of Laboratory , London United Kingdom.